Background and Objective: Childhood obesity is an important risk factor for the development of metabolic syndrome (MS) in children and adolescent. Because of high prevalence of insulin resistance and MS in Indian adult population, studies are needed to identify the prevalence of these metabolic abnormalities in the adolescent population. The objective of this study was to estimate the prevalence of MS using pediatric International Diabetic Federation (IDF) definition and compare it with estimates of Adult Treatment Panel III (ATP III) definition among adolescents in Northern India. Materials and Methods: At a total of 899 adolescents attending school (aged 10-18 years) participated in this population-based prospective study. All the clinical and biochemical assessment were done after proper consent. The MS was determined by the National Cholesterol Education Program ATP III definition modified for age and pediatric IDF definition. Results: The prevalence of MS was 3.5% according to ATP III criteria and 1.5% based on IDF criteria. 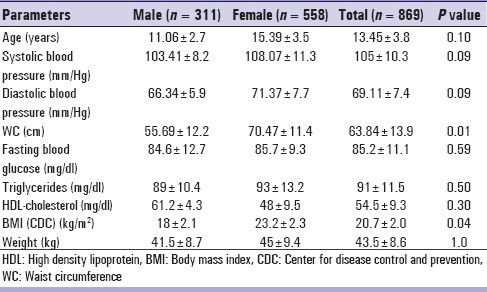 No significant gender difference was observed in the distribution of MS. Hypertriglyceridemia was the most common and abdominal obesity the least common constituent of MS. Conclusion: This study provides the first estimates of MS using pediatric IDF definition in the adolescent population from Northern India. Studies from South Asian children including India have shown prevalence rates ranging from 2% to 9%. , This could be attributed to the high level of insulin resistance among them. Furthermore, the relation between adiposity and insulin concentrations is stronger in South Asian children than among white Caucasian children. South Asian children have higher mean fasting levels of insulin and fasting blood glucose and a higher prevalence of impaired fasting glucose than European Caucasians. , Although limited, studies from North India have shown high prevalence of MS like other South Asian studies. , The prevalence estimates of MS using IDF definition are not available from India. We therefore analyzed data according to ATP III definition of metabolic MS, examined its demographic variation and estimated the prevalence according to IDF definition, which happens to be the latest organized definition  in the Northern Indian state of Kashmir. This cross-sectional population-based study was carried out in a representative sample of 889 children aged 10-18 years selected from different schools. The study was conducted in a multistage manner over a period of 2 years (October, 2009-October, 2011) among children selected by a simple randomization method. There are total six towns among, which four are major and urbanized. There are approximately five to eight schools in each town. Four schools with enrollment more than 1000 were selected from four major towns. All the schools selected were of equal standard with almost equal children population and distribution. From each school, following children were selected in the first phase. Children who had consent from parents. Children who were not suffering from any metabolic disease. Children not on any medication in any form. A total of 1100 children (in all the four schools) were selected in this stage. These children were selected by simple randomization. The sample size for the study was calculated from the formula given by Daniel. This formula is based on the assumption of normal approximation. Finally, 889 children turned up for the study. The study was approved by Ethical Committee Sher-i-Kashmir Institute of Medical Sciences, Srinagar, Kashmir, Director Education Kashmir and proper approval from respective institutional bodies was obtained. The consent from the parents of children for examination and blood sampling was taken after explaining to them the purpose of the study. A team consisting of 2-3 doctors, a nurse, lab technician and a helper visited each individual school on prefixed dates. Children were asked to come fasting on the day of sampling (≥8 h fast). About 10 ml nonhaparinized venous blood samples were drawn from nondominant arm without using tourniquet. Serum was separated within 2 h of venipuncture, and analysis was done within 24 h. Biochemical parameters were analyzed with commercially available enzymatic reagents (Audit Diagnostics, Ireland) adapted to the Hitachi 912 auto analyzer. All subjects underwent anthropometric assessment such as measurement of height, weight, body mass index (BMI), waist circumference (WC), and measurement of blood pressure. Body weight was measured by an electronic scale (Filizola ® ) to the nearest 0.1 kg while the school children were barefoot and wearing light clothes. Height was determined by a portable Seca ® Stadiometer to the nearest 1 cm, according to norms proposed by the World Health Organization (1995). BMI (weight in kilograms divided by the squared height in meters) was calculated by using the measured height and weight and converted to percentiles for age in months and gender by using the Center for Disease Control and Prevention, 2000 growth charts and computer software Epi-Info® version 3.2 (2004). Indian BMI Percentiles were used to classify children in different classes. WC was measured midway between the rib cage and the superior border of the iliac crest by using a milli-metric nonextensible and nonelastic measuring tape (Sanny ® ) in mid respiration and inferences were drawn in percentiles. Metabolic syndrome was defined using modified ATP III criteria ,, as well as IDF criteria  and the results were compared with each other. Systolic blood pressure or diastolic blood pressure ≥90 th percentile for age and gender. WC ≥90 th percentile for age and gender. Systolic blood pressure ≥130 mmHg or diastolic blood pressure ≥85 mmHg. Data were analyzed by SPSS 11.5 version. The prevalence was reported in percentages. Factor analysis and inference were drawn using Chi-square test for proportions and Man-Whitney U-test for comparison of independent groups. A two-tailed P value was used for calculating statistical significance. A P < 0.05 was taken as statistically significant. Of total 1100 children, 899 children turned up for the study. The sample population of 899 children and adolescents was a heterogeneous population and consisted of 311 males and 588 females. Their mean age was 13.4 ± 3.8. The characteristics of the subjects are shown in [Table 1]. According to ATP III criteria, 3.5% children aged 10-18 years had MS, whereas 1.5% children of similar age group had MS according to IDF criteria [Table 2]. The prevalence of MS in males versus females was statistically insignificant in both criteria. Factor analysis according ATP III criteria showed that hypertriglyceridemia was most prevalent factor followed by low HDL-C, hyperglycemia, hypertension, and WC. Among these factors hypertriglyceridemia and hyperglycemia showed statistically significant difference between two sexes [Table 2]. In both criteria, high prevalence of MS was seen in the age group 13-15 years and the difference across different age groups was significant in ATP III criteria. All metabolic parameters except high blood glucose were highly prevalent in the same age group, which corresponds to puberty age. Again abdominal obesity, blood pressure and hyperglycemia showed statistically significant difference across different age groups [Table 2]. The factors which significantly contributed to MS were blood pressure, WC, blood glucose, BMI, fatty liver, and low HDL. 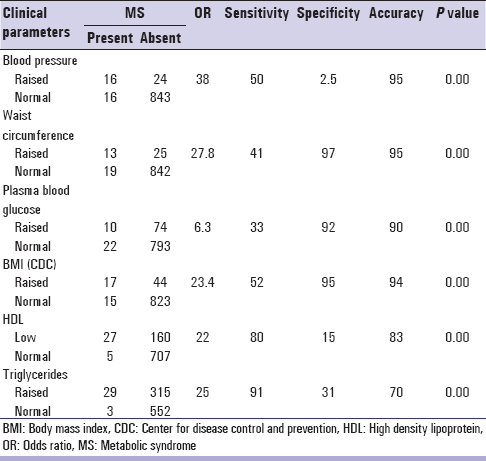 Among all these factors WC was the most significant contributing factor (Or-27.8; sensitivity-41, specificity-97; accuracy-95; P = 0.000) [Table 3]. Low prevalence of MS was observed when IDF definition was applied, which could be due to the fact that the IDF retained the adult cut points of its adult definition. ATP III uses lower cutoffs for blood pressure and triglyceride levels. Data from India though limited has shown prevalence in nonobese children ranging from 0.8% to 5%. , The prevalence of MS in nonobese children in our study is alarming and needs attention. According to Barker's hypothesis, there is a links between reduced birthweight and increased risk of coronary heart disease, diabetes, hypertension, and stroke in adulthood. A systematic review reported that the majority of 80 studies on adults and children showed that there is a 2-mmHg decrease in systolic blood pressure per kilogram increase in birthweight. This relationship is less well-defined in adolescence, possibly because "tracking" of blood pressure with age is disturbed at the time of the adolescent growth spurt. Maximum prevalence (6.8% with ATP and 2.7% with IDF) was seen around the puberty (defined by age and not evidenced clinically or biochemically). No statistically significant difference was seen between two sexes although significant differences were observed across age groups. The effects of obesity on early puberty development have been shown though not conclusively established. , However, effects of puberty on obesity are not known. Normal puberty in girls is accompanied by increases in BMI and subcutaneous adiposity. Also, lipid abnormalities, particularly in males, are affected by puberty. Whether these normal physiological processes have any significance in the development of obesity and MS around puberty in susceptible persons needs further elucidation. This study provides the first estimates on the prevalence of MS with ATP III and pediatric IDF definition in Northern Indian Adolescent population. Both the definitions showed high prevalence around the age of puberty. Immediate lifestyle modifications are needed to control the obesity epidemic and its metabolic consequences. Furthermore, research is needed to know the effects of puberty on obesity and its late consequences. Li Y, Yang X, Zhai F, Piao J, Zhao W, Zhang J, Ma G. Childhood obesity and its health consequence in China. Clin Endocrinol 2008;9:82-6. Cook S, Weitzman M, Auinger P, Nguyen M, Dietz WH. Prevalence of a metabolic syndrome phenotype in adolescents: Findings from the third National Health and Nutrition Examination Survey, 1988-1994. Arch Pediatr Adolesc Med 2003;157:821-7. Strauss RS, Pollack HA. Epidemic increase in childhood overweight, 1986-1998. JAMA 2001;286:2845-8. Burke V, Beilin LJ, Simmer K, Oddy WH, Blake KV, Doherty D, et al. Predictors of body mass index and associations with cardiovascular risk factors in Australian children: A prospective cohort study. Int J Obes (Lond) 2005;29:15-23. Chatelain P. Children born with intra-uterine growth retardation (IUGR) or small for gestational age (SGA): Long term growth and metabolic consequences. Endocr Regul 2000;34:33-6. Wei JN, Sung FC, Li CY, Chang CH, Lin RS, Lin CC, et al. Low birth weight and high birth weight infants are both at an increased risk to have type 2 diabetes among schoolchildren in Taiwan. Diabetes Care 2003;26:343-8. Bhowmik B, Afsana F, My Diep L, Binte Munir S, Wright E, Mahmood S, et al. Increasing prevalence of type 2 diabetes in a rural Bangladeshi population: A population based study for 10 years. Diabetes Metab J 2013;37:46-53. Alberti G, Zimmet P, Shaw J, Bloomgarden Z, Kaufman F, Silink M, et al. Type 2 diabetes in the young: The evolving epidemic: The International Diabetes Federation Consensus Workshop. Diabetes Care 2004;27:1798-811. Zimmet P, Alberti KG, Kaufman F, Tajima N, Silink M, Arslanian S, et al. The metabolic syndrome in children and adolescents - An IDF consensus report. Pediatr Diabetes 2007;8:299-306. Ten S, Maclaren N. Insulin resistance syndrome in children. J Clin Endocrinol Metab 2004;89:2526-39. Park HS, Han JH, Choi KM, Kim SM. Relation between elevated serum alanine aminotransferase and metabolic syndrome in Korean adolescents. Am J Clin Nutr 2005;82:1046-51. Serap S, Mevlüt B, Inanç C, Ender S. Metabolic syndrome in childhood obesity. Indian Pediatr 2007;44:657-62. Reddy AA, Dixit MN, Kumar MR, Jaganmohan P. Evaluation of prevalence of metabolic syndrome in corporate school children at Nellore District Andhra Pradesh, India. Glob J Biotechnol Biochem 2011;6:192-6. Whincup PH, Nightingale CM, Owen CG, Rudnicka AR, Gibb I, McKay CM, et al. Early emergence of ethnic differences in type 2 diabetes precursors in the UK: The Child Heart and Health Study in England (CHASE Study). PLoS Med 2010;7:e1000263. Whincup PH, Gilg JA, Owen CG, Odoki K, Alberti KG, Cook DG. British South Asians aged 13-16 years have higher fasting glucose and insulin levels than Europeans. Diabet Med 2005;22:1275-7. Wasir JS, Misra A. The MS in Asain Indians; the impact of nutrition and socio-economic transition in India. MS related disorder 2004. Diabet Med 2007;24:195-9. Singh R, Bhansali A, Sialy R, Aggarwal A. Prevalence of metabolic syndrome in adolescents from a North Indian population. Diabet Med 2007;24:195-9. Misra A, Khurana L, Vikram NK, Goel A, Wasir JS. Metabolic syndrome in children: Current issues and South Asian perspective. Nutrition 2007;23:895-910. Daniel WW. Biostatistics: A Foundation for Analysis in the Health Sciences. 7 th ed. New York: John Wiley & Sons; 1999. Zimmet P, Alberti G, Kaufman F, Tajima N, Silink M, Arslanian S, et al. The metabolic syndrome in children and adolescents. Lancet 2007;369:2059-61. Kumar HN, Mohanan P, Kotian S, Sajjan BS, Kumar SG. Prevalence of overweight and obesity among preschool children in semi urban South India. Indian Pediatr 2008;45:497-49. Viner RM, Segal TY, Lichtarowicz-Krynska E, Hindmarsh P. Prevalence of the insulin resistance syndrome in obesity. Arch Dis Child 2005;90:10-4. National Cholesterol Education Panel, Report of the Expert Panel on Blood Cholesterol Levels in Children and Adolescents. Bethesda, MD: National Institutes of Health; 1991. NIH Publication No. 91-2732. Boney CM, Verma A, Tucker R, Vohr BR. Metabolic syndrome in childhood: Association with birth weight, maternal obesity, and gestational diabetes mellitus. Pediatrics 2005;115:e290-6. Alberti KG, Zimmet P, Shaw J, IDF Epidemiology Task Force Consensus Group. The metabolic syndrome - A new worldwide definition. Lancet 2005;366:1059-62. Vikram NK, Misra A, Pandey RM, Luthra K, Wasir JS, Dhingra V. Heterogeneous phenotypes of insulin resistance and its implications for defining metabolic syndrome in Asian Indian adolescents. Atherosclerosis 2006;186:193-9. Golley RK, Magarey AM, Steinbeck KS, Baur LA, Daniels LA. Comparison of metabolic syndrome prevalence using six different definitions in overweight pre-pubertal children enrolled in a weight management study. Int J Obes (Lond) 2006;30:853-60. Tailor AM, Peeters PH, Norat T, Vineis P, Romaguera D. An update on the prevalence of the metabolic syndrome in children and adolescents. Int J Pediatr Obes 2010;5:202-13.
de Boo HA, Harding JE. The developmental origins of adult disease (Barker) hypothesis. Aust N Z J Obstet Gynaecol 2006;46:4-14. Huxley RR, Shiell AW, Law CM. The role of size at birth and postnatal catch-up growth in determining systolic blood pressure: A systematic review of the literature. J Hypertens 2000;18:815-31. Dunger DB, Ahmed ML, Ong KK. Effects of obesity on growth and puberty. Best Pract Res Clin Endocrinol Metab 2005;19:375-90. Burt Solorzano CM, McCartney CR. Obesity and the pubertal transition in girls and boys. Reproduction 2010;140:399-410. Morrison JA, Sprecher DL, Biro FM, Apperson-Hansen C, Dipaola LM. Serum testosterone associates with lower high-density lipoprotein cholesterol in black and white males, 10 to 15 years of age, through lowered apolipoprotein AI and AII concentrations. Metabolism 2002;51:432-7. Misra A, Vikram NK, Sharma R, Basit A. High prevalence of obesity and associated risk factors in urban children in India and Pakistan highlights immediate need to initiate primary prevention program for diabetes and coronary heart disease in schools. Diabetes Res Clin Pract 2006;71:101-2. Unnikrishnan R, Anjana RM, Mohan V. Diabetes in South Asians: Is the phenotype different? Diabetes 2014;63:53-5. Yajnik CS, Lubree HG, Rege SS, Naik SS, Deshpande JA, Deshpande SS, et al. Adiposity and hyperinsulinemia in Indians are present at birth. J Clin Endocrinol Metab 2002;87:5575-80.